MiniMega, Bass Guitar Amp Head from Peavey. Announced as delivering classic Peavey tone, the MiniMega produces a full and rich sound in a compact package that weighs in at 9 lbs. Using technology not found in other bass amps, the MiniMega aims at representing a new level of compact bass amplifier performance. Peavey’s proprietary Kosmos enhancement provides increased bass impact, while the psychoacoustic low-end enhancement adds bass without overburdening speakers. 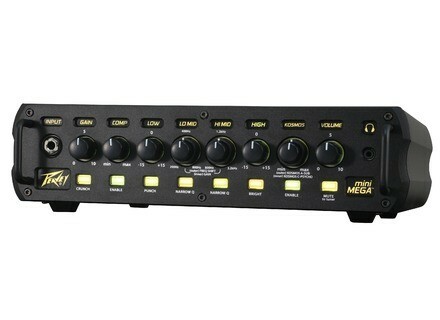 The MiniMega contains additional modern features such as a built-in compression with defeat switch, a 4-band EQ with Punch and Bright switches, and semi-parametric mid controls with narrow Q controls. The back panel has all the connectivity necessary to patch in effects or connect to a sound reinforcement system. Also featuring an effects loop, gain control, crunch button, tuner output, master volume, mute control and more, the MiniMega aims at delivering the high level features that today’s professional bass player demands. With 1,000 watts continuous into 4 ohms, the head features a 1/8” headphone output, two twist-lock combo 1/4" outputs, DI output with XLR, and DI pre-post switch. Also included is a MIDI footswitch input, DDT limiter, ground lift, and Pad controls. Complete with user-definable control surface color lighting, the MiniMega comes with a carrying bag. Official MSRP is $799.99 with an estimated street price of $599.99. More details available from Peavey's website. Seymour Duncan Quarter Pound For 5-String P-Bass Seymour Duncan has released a new variation of its Quarter Pound bass pickup specially designed for 5-string Precision Bass-style instruments. [BKFR] Black Friday sale at Source Audio Source Audio is offering various discounts on some of their stompbox models for guitar and bass.